Most of what DWDP reports on November 2nd will be both confusing and fairly meaningless in our view. The key will be to focus on cash – generation and usage. The quarter will have two months where the companies were separate and one where the entity is combined – DWDP may choose to report numbers with DOW and DD as segments! More likely the company will try to pro-forma the expected spin companies; Materials, Ag and Specialty, but given that there has only been around 6 weeks since the shape of the finals splits were announced, this may be a lot to ask. Reported earnings are likely to be riddled with one-time items, charges, fees, discontinued businesses, etc. Consequently, reported EPS is likely to be of little value. Merger costs will be in the hundreds of millions of dollars. DD’s crop protection business should be listed as discontinued and reported separately. There will likely be costs associated with achieving synergies rather than benefits. But as the saying goes “Cash is King” and we will be looking for cash generation – ex charges – and expected cash deployment – specifically dividend and buyback policies for the interim period prior to the spins. In Q2 2017 DOW and DD generated a combined EBITDA of $4.3bn ($2.5bn at DOW). 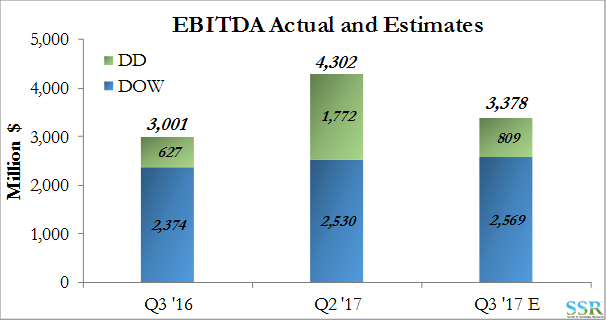 As of August 31st, the combined EBITDA estimate for Q3 2017 was $3.38bn ($2.57bn at Dow). The drop in DD is seasonal and seed sales related. Q3 2017 estimates were for combined EBITDA growth of 12.5% from Q3 2016 – Exhibit 1. During the quarter, there will be lost EBITDA from the hurricane damage, but the number adjusted for that should be compared to the estimate of $3.38bn. EPS will be irrelevant. Cash use is equally important as apart from confirming the DD preferred dividend, the company has yet to say anything about an interim dividend and share buy-back policy. The market is likely to take any cut in yield very negatively and consequently we would not expect the company to make that mistake. There is a case for raising the interim dividend given the $10bn of cash on the balance sheet – and/or a buyback. Two months in, we would expect some further detail on the synergy targets – timeline, quantum, costs to achieve etc. We would not be surprised to hear the company talk about some higher expectations – especially as management reacts to questions about the spin-offs and the costs associated with those additional corporate structures and the transaction costs themselves. Is Material Science still expected to be first? Which is second? When? Is the “remainco”, whether it is Specialties or Ag, likely to get saddled with either debt or a bunch of DOW/DD liabilities? Do pension liabilities move in proportion to employed and retired headcount for example? In theory, the more stable cash flow businesses (which should be Specialty and Ag) could hold more debt than Materials in proportion to EBITDA and retain a higher rating. Will Material Co keep the asbestos liability for example; with Specialties keep the legacy DD liabilities – such as the current potential Cape Fear River GenX liabilities. We continue to believe that DWDP is one of the best investment ideas in large cap Industrials and Materials today and refer back to the larger body of work that we have produced this year – links below. We see upside to $100 per share by 2019 as cash flows (helped in part by synergies) drive further deals, and aggressive share buyback, driving strong EPS growth. January 5, 2017: Dow/DuPont – Again in 2017!